HOUSTON, TEXAS (January 18, 2014) The Houston Cougars jumped out to seven point lead at the end of the first half and came back like a team possessed with five players scoring in double figures to down the Rutgers Scarlet Knights by the score of 77-55 in front of 3,115 fans at Hofheinz Pavilion in Houston on Sunday, January 19, 2014. The Cougars were never seriously challenged in the second half, outscoring the Scarlet Knights 42-27 in the final 20 minutes. Danrad Knowles scored 16 points in his first start as a Cougar. He was 6-of-8 from the floor and 3-of-3 from the line in addition to snatching eight rebounds. Danuel House, who returned to the Cougars’ lineup after knee surgery, scored 14 points and pulled down six defensive rebounds in 27 minutes of play. TaShawn Thomas and Brandon Morris each scored 12, with Jherrod Stiggers adding 11. The game was in stark contrast to three days earlier, when the Cougars faced the defending national champion Louisville Cardinals, and came away with a 91- 52 loss. The bench was the difference in the game against Rutgers, with Houston scoring 35 points off the bench while Rutgers could manage only 15. With the win, the Cougars are now 11-7 for the season and 3-2 in conference play; tied in third place with SMU and Memphis. The Cougars will face Memphis for the first time this season on Wednesday, January 23, 2014 in Memphis and SMU on Sunday, January 26, 2014 at Hofheinz Pavilion. Both games will be broadcast on television on the ESPN News channel and on the radio at 950 AM KPRC. HOUSTON, TEXAS (January 12, 201`4) Houston Baptist’s Tyler Russell scored 16 points against Northwestern State on Saturday evening, but his final two points of the game will be remembered for years to come. With HBU railing 97-96 late in the game, the junior guard hit a baseline jumper with seven-tenths of a second remaining to give the Huskies a 98-97 win over the Demons at Sharp Gymnasium in Houston on January 11, 2014. HBU led by 15 points at the 16:47 mark in the second half, but the Demons battled back to take a one point lead with 16 seconds left in the game. The Huskies got the ball back after the score, which allowed Russell to take a shot with six seconds remaining. His shot missed and was quickly rebounded by Marcel Smith, who passed the ball back to Russell for the winning shot. The win was the first-ever for HBU in Southland Conference action and raised their season record to 4-12 and a 1-3 conference mark. 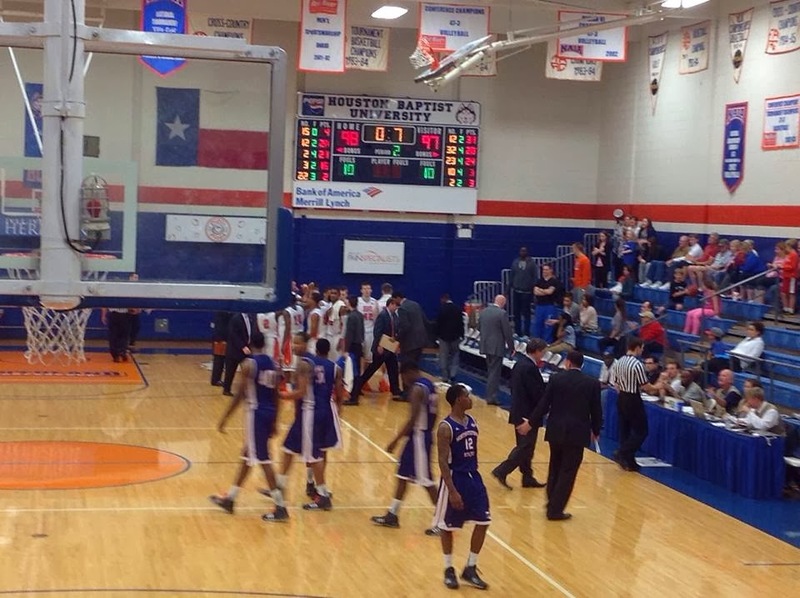 Smith tallied 21 points for HBU, followed by Rob Lewis with 20 and Russell’s 16. Cody Joyce also scored in double-digits with 10 points. Eleven Huskies got into the scoring column, with the bench recording 37 of HBU’s 98 points. The Huskies scored 40 points in the paint, 18 second chance points and six on fast-breaks. Reveal Chukwujekwu pulled down 11 of the Huskies 39 rebounds while Dauson Womack added eight. For the Demons, Jalen West scored 31 points, with Zikiteran Woodley adding 24 and DeQuan Hicks with 20. HBU will hit the road for their next two contests, facing Nicholls State on January 16 and McNeese State on January 18. The McNeese State game will be broadcast on ESPN3. HOUSTON, TEXAS (January 5, 2014) Those fans in attendance at Fonde Recreation Center on Saturday, January 4, 2014 in Houston were witness to some of the best high school basketball action in the nation in the Fonde Hall of Fame Games. Day two of the Fonde Hall of Fame Games saw eight teams battling it out on the hardwood inside the Fonde Recreation Center with each of the games named after a basketball legend that was in attendance to present awards to those players and teams in their signature named game. The first matchup, the Dave Lattin Game, featured Trent International (4-5) from Sugar Land, Texas facing Bellaire High School (10-4) from Houston. Lattin, who was Houston's first high school basketball All-American when he played at Worthing High School, was the starting center for the Texas Western Miners when they won the 1966 NCAA basketball championship. He later played professionally for the San Francisco Warriors and the Phoenix Suns. In a match that had Bellaire leading 28-22 at the half, those in attendance saw Trent rally back, scoring 33 points in the second half, to win the game 55-53. Simonas Januskis scored16 points for Trent, followed by DaRon Curry with 14 and Lbrahim Dumbia with 10. For Bellaire, Christian James connected for 22 points, while Jarren Greenwood added 11. In the 3:30 p.m. game Tulsa SOYLA faced Episcopal (Houston) High School in the Elvin Hayes game. Hayes played his college ball for the Houston Cougars and currently is a radio analyst for the Cougars. He is a member of the Naismith Basketball Hall of Fame and was the NBA’s 50th Anniversary All-Time Team. In the Elvin Hayes game, Episcopal downed SOYLA, 59-42. Jamel Williams was the high scorer for Episcopal with 17 points, with Qyemah Gipson leading SOYLA with 12 points. The 6:30 p.m. match, the Calvin Murphy Game, saw Euless Trinity facing off against St. John’s School from Houston. Prior to 1992, the Houston Rockets were known as the San Diego Rockets. Tied at 45-all in regulation, St John’s edged out Trinity 51-49 with Justine Winslow scoring 34 points for St. John’s. The 6-6, 205 pound guard has signed with Duke and is ranked 14th nationally also had 16 rebounds. "You hear the hype around the city about the game, but coach keeps us grounded. We approached it like a regular game. We just wanted to win. If I would have had two points and we won, I would be happy. I just want to put my team in the best position to win." For Trinity, Myles Turner has 16 points and seven rebounds. He is ranked number two in the current ESPN rankings. The final game of the evening, the Moses Malone Game had Milwaukee’s Rufus King High School playing Yates High School from Houston. Moses Malone played for nine different professional teams, including the Houston Rockets from 1976-1982. Yates, who came into the game sporting a 7-4 record, fell to Rufus King (8-1) by the score of 80-59. J.C. Washington scored 21 points for Yates while Chris Howell tallied 22 for Rufus King. HOUSTON, TEXAS (January 5, 2014) Leading by as much as 21 points at one point in the game, the Rice Owls went on to defeat the Incarnate Word Cardinals by the score of 72-57 in women’s basketball action in front of 393 fans at Tudor Fieldhouse in Houston, Texas on Friday evening, January 3, 2014. The Owls had three players in double figures; Christal Porter with 17 points, followed by Jasmine Goodwine with 16 points and Jessica Kuster with 13 points. With her 13 points, Kuster (shown right) moved into third place in team career points with 1,712. 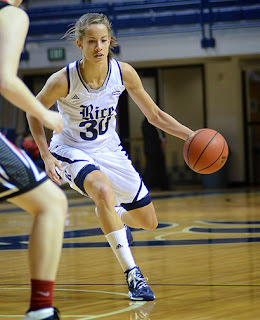 She is now only 79 points away from second place on the list, which is currently held by Holly Jones, who played for Rice from 1984 to 1988, and scored 1,791 points during her tenure. The Owls were never really threatened by the Cardinals, who were ahead by two points 30 seconds into the game. After that, Rice did not relinquish the lead the rest of the game. Kuster also tallied 13 rebounds to lead all players. The Owls shot 45% (29-of-64) from the field and 93% (14-of-15) from the free throw line. For the Cardinals, Rose Whitehead scored 20 points, followed by Joslinn Douglas with 17 and Ifunanya Mora with 11. Kosisio Mora led the Cardinals with eight rebounds. With the win, the Owls moved to 7-6 for the season and will begin Conference USA play on January 8 when they travel to Miami to take in Florida International with a 6 p.m. ET start. They return to Tutor Fieldhouse on January 15 where they will face Louisiana Tech in a 7 p.m. CT matchup.